1970's New York Jets Riddell Football Helmet Wall Plaque Plaque measures 15" by 15". Wood finish with nice name plate. Wood frame has a couple of nicks. Would look fantastic hanging in your bar / sports rec room. Please check out my other wall plaques and vintage memorabilia in my store on E-bay. 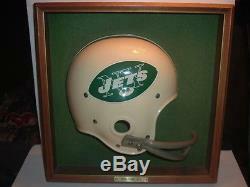 The item "1970's New York Jets Riddell Footall Helmet Plaque" is in sale since Tuesday, February 10, 2015. This item is in the category "Sports Mem, Cards & Fan Shop\Fan Apparel & Souvenirs\Football-NFL". 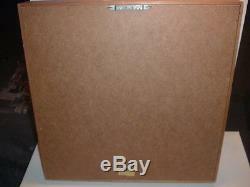 The seller is "thelip13" and is located in Cleveland, Ohio.